How well do you Emotionally Connect? I have noticed in my fields of research and competitive intelligence that we have this tendency to drown our customers with data, and while they might be impressed that we dug up all this information, they usually don’t want the details. We also talk the language of competitive analysis, which most people don’t resonate with, and there is no emotional connection—since competitive intelligence is not the issue. Solving a business problem or uncovering and entering new markets or product development are the issues. Companies pay competitive intelligence professionals to provide them with what’s relevant and to weed out all the excess, which is most of the information that’s out there. Most of the time your customers will connect if you put together a crisp set of information and persuasively articulate your findings, and include some analysis, if it adds clarity and persuasiveness to your recommendations. But whoa, remember everyone that you’re addressing has a different communication style, and it’s really all about them and not about you. This is a guiding principal of cooperative communication a key element of cooperative intelligence. Some people do want the details, and not just access to them “later”. You better present them and be ready to be grilled since they will have questions! Companies need these type of people to bring balance to decision-making and to avoid being blindsided. Not everyone can or should be a visionary! 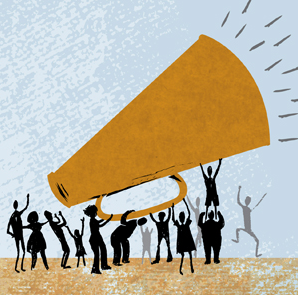 Cooperative communicators know that they’re talking for their audience not TO their audience. Their attitude and practice is to listen to their audience, and to query ahead of time about how to connect with the key issues and concerns of their audience (or clients), and in a way that will stick with them. There is another problem with all that data: it’s historic. The reams of research are helpful however, if you’re trying to put together some scenarios, since you need to be pretty thorough in developing scenarios to include all the factors that might change the scenario, to observe the patterns in the marketplace, including the competition and to conclude with a scenario that you believe is the most likely. You ultimately want to get out your crystal ball and forecast where the market is heading, right? And better yet, be visionary and LEAD the market! Back to Mr. Godin: emotional connection is what happens when you engage people. That doesn’t happen with some myriad of facts and figures. It happens because they believe. How do you communicate to make them believe? Filed under: communication, competitive analysis, Competitive Intelligence, connection, cooperative, Cooperative Intelligence, product development, research |	Comments Off on How well do you Emotionally Connect?